You won’t believe how easy it is to get email marketing working for you. 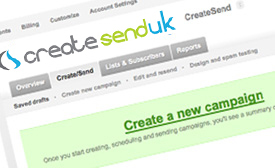 CreateSendUK offers great features that will blow your socks off. Our aim is to make things as simple as possible. We take the pain out of delivering email campaigns so all you have to worry about is what you want to say! Create your own great looking email campaigns with ease. It’s so simple and fast, you just select a template and add your own content with no technical knowledge required. 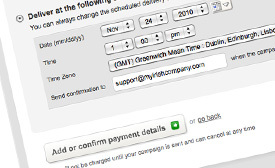 Send personalised emails to all your subscribers immediately or schedule for later delivery. Campaigns are delivered by Industry leading mail servers with full support for email domain authentication. 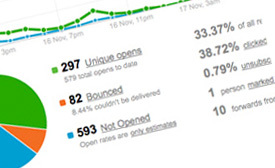 View real time reports of opens, clicks, bounces and much more. 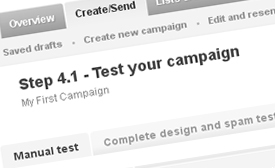 Easily analyse and compare multiple campaigns. Full integration with Google Analytics is also provided. 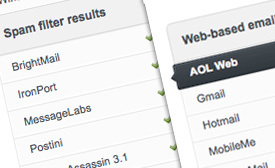 Import your email lists and filter subscribers to target specific groups. 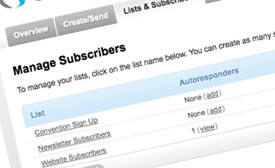 Automated list management to organise unsubscribed emails and remove duplication. No set up fees, just pay when you send each campaign. You can even send up to 5 free emails for each campaign – its true! Single-click design and delivery testing gets your email tested against popular spam filters, firewalls & email programs. This will help you achieve the best possible delivery rates.